You asked we and we listened! Introducing our first ever Specialty Trip for 12-14 year olds, and our first ever ALL CAVING program! You will navigate the twists and turns and awe-inspiring caverns of some of the most unique environments of the Appalachian mountains. Along the way you'll gain an understanding of the geology and history of our Southwest Virginia caves. You'll explore parts of caves most groups never get to see and enjoy the adventure of scrambling around rocks and cave features. You'll camp out each night under the stars and form unique bonds with adventurers who love caves as much as you do! Get ready for a lot of words like that, and like troglobites, karst, millenia, cave popcorn, and more! 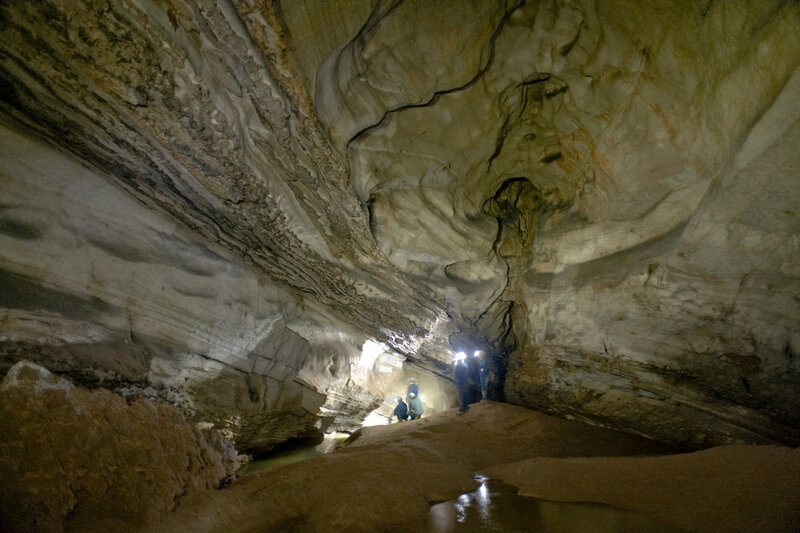 Not only will you get to navigate through wild caves (no pathways, no lights) but you will gain and understanding how those caverns form and the long history of speleological (spee-lee-AH-lo-gi-col) study that scientists have used to understand more about the world beneath our feet. Science is awesome, science that you can climb over, crawl under, and shimmy through is even better. On this trip, cavers will explore limestone caves and geological formations everyday, including awesome caves in the Blacksburg and Covington areas. With whole days devoted to caving, adventurers will have the chance to seek out unique parts of the caves that groups on our Classic Adventure may not be able to see. True to the nature of all of our trips, adventurers will camp out, eat backpacking food, and carrying all of their gear in backpacks. The idea is that within the scope of a caving program, participants are able to gain self-confidence and leadership skills by interacting in a wilderness environment. A strong focus will be honing communication skills while in the cave and the teamwork that will come from facing challenges as groups choose their paths through caves and navigate uneven terrain. The environment inside these amazing caves is a lot different from the one outside. Participants will be using safe practices of travelling in caves and LNT principles while they explore, which means all the gear we will use will support the principles of leaving the environment better than it started. Cavers will use cave suits, helmets, gloves, head lamps, and leaders will carry important emergency supplies which participants will learn about. One of the leaders will be a Wilderness Adventure Caving Instructor and participants will be safely guided through well-known caves and challenged to navigate in a safe environment.